As The Salvation Army celebrates its 150-year anniversary, we’re already looking ahead to the future and the next 150 years . . . and you can be part of this exciting, evolving landscape! As a Salvation Army SESQUICENTENNIAL CAMPAIGN SUPPORTER, your continued support of our existing programs will be critical in helping us to evolve to best meet the ever-changing needs of the communities we serve. To become a SESQUICENTENNIAL SUPPORTER or to learn more about The Salvation Army’s 150th Anniversary Campaign, please call (212) 337-7339. Thank you very much for all your support during this landmark anniversary year! William Booth, founder of The Salvation Army, is born April 10th, in Nottingham, England. Catherine Mumford, co-founder of The Salvation Army, is born January 17th, in Ashbourne, Derbyshire, England. She and William Booth would meet in 1851. William Booth embarks upon his ministerial career on the streets of London, England, preaching the gospel of Jesus Christ to the hungry, homeless, and destitute. 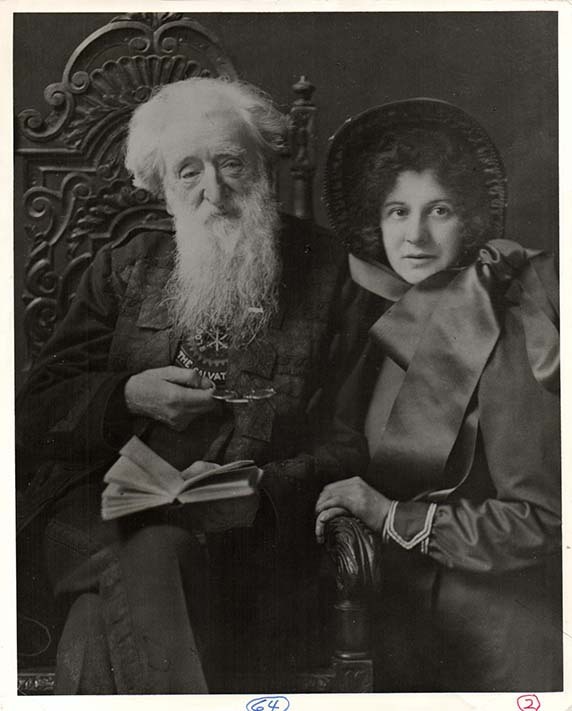 William and Catherine Booth found the movement that will become The Salvation Army — known in its earliest days as “The Christian Mission” — in July. With the spirit of professional soldiers, they battle against overwhelming social ills, biased public policy, and ignorance as they minister to society’s poor and marginalized. William Booth officially renames The Christian Mission “The Salvation Army” and its members become known as “Salvationists.” Brass instruments, a staple of The Salvation Army’s ministry in the decades to come, are used for the first time. The Salvation Army crest is designed when The Christian Mission changes its name to The Salvation Army and begins adopting a military style, with uniforms and military terms. The first flag of The Salvation Army, designed by Salvation Army co-founder Catherine Booth, was, initially, crimson with a navy-blue border, which symbolized holiness, and a yellow sun in the middle, which was later replaced by a star, that signified the fiery baptism with the Holy Ghost. The motto written on the star, “Blood & Fire,” stands for the Blood of Christ and the Fire of the Holy Ghost. The Salvation Army flag has even been flown on the moon. Salvation Army Lieutenant Eliza Shirley leaves England for America to join her parents, who had immigrated there earlier. Lieutenant Shirley holds in Philadelphia what is considered to be the first meeting of The Salvation Army in America. On March 10th, Salvation Army Commissioner George Scott Railton and seven “Hallelujah Lassies” (as these women Salvation Army officers were called) arrive in Battery Park, New York City, from England, marking the first official “landing” of The Salvation Army in America. Railton and his “troops” would serve as the foundation for the work of The Salvation Army in the Greater New York area and across the nation. President Grover Cleveland receives a delegation of Salvation Army officers and gives them a warm personal endorsement — the first such recognition from The White House for The Salvation Army. 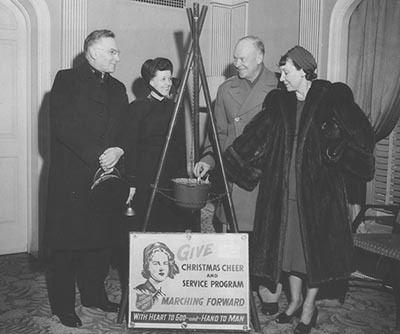 Salvation Army Captain Joseph McFee places a kettle at the Oakland Ferry Landing in San Francisco to collect money to buy Christmas dinner for the poor. McFee’s efforts became the forerunner of what would become one of The Salvation Army’s most endearing symbols and beloved fundraising campaigns — the red kettle at Christmastime. 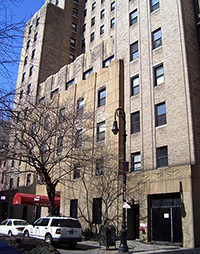 The Salvation Army opens its first men’s food and shelter depot in Greenwich Village, New York City, with an equally large shelter for women, The Daybreak, opening in the Bowery. The Salvation Army begins its relationship with America’s armed forces as Salvation Army officers accompany troops to the Philippine Islands during the Spanish-American War. The Salvation Army begins disaster-relief services in the U.S. The Salvation Army Limelight Department in Australia is credited with producing the world’s first multi-media presentation using the moving-picture film technology of the day. The Salvation Army opens its own labor exchange in London to help poor people find jobs. It was not until 1909 that Parliament passes a law providing for the establishment of nationalized labor exchanges. The Salvation Army’s first major U.S. disaster response takes place in Galveston, Texas, when Salvation Army officers from all over the country are sent there to serve in the aftermath of a catastrophic hurricane that destroys the city. The Salvation Army red shield is first introduced, its origins believed to be rooted in Canada. The red shield goes on to become the most recognizable, year-‘round symbol of The Salvation Army. 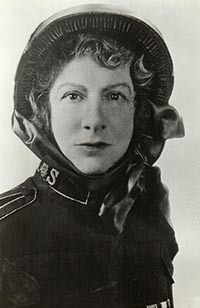 Eva Booth (seventh child born of Salvation Army founders William and Catherine Booth) is given command of The Salvation Army in the United States. At this time, on the advice of friends, she changes her name to Evangeline. She is an excellent athlete and plays several instruments. 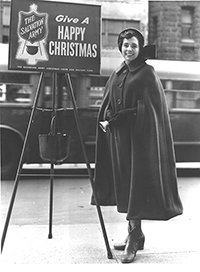 In fact, many of her songs are sung in The Salvation Army today. Her dramatic ability was often compared to actress Sarah Bernhardt. For 30 years, Evangeline Booth serves as the Commander of The Salvation Army in America. Under her leadership, she expands the social services of The Army by establishing hospitals for unwed mothers, soup kitchens, emergency shelters, services for the unemployed, and homes for the elderly. 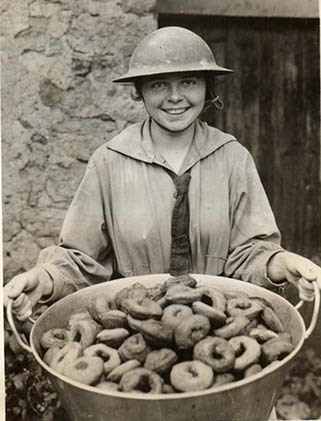 During World War I, Salvation Army “Doughnut Lassies” (female Salvation Army volunteers) serve doughnuts on the frontlines to American troops in France. 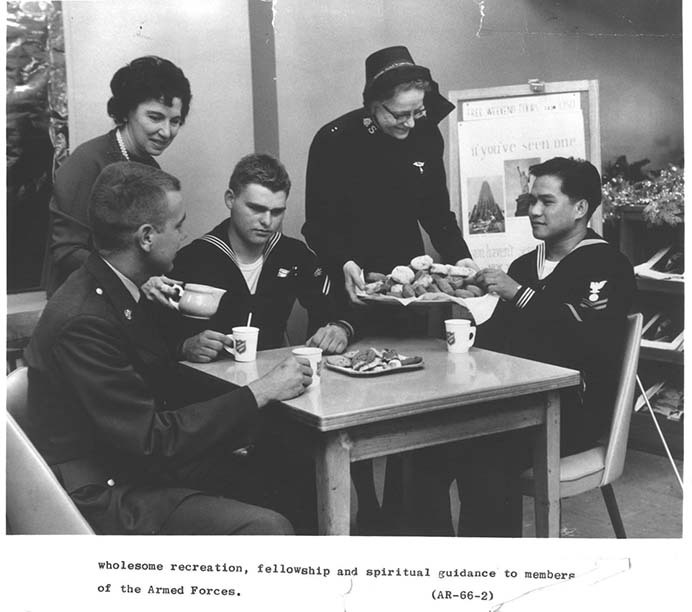 The simple doughnut would become a symbol of all The Salvation Army was doing to ease the hardships of fighting soldiers on the frontlines. This effort would serve as the basis for Salvation Army “National Donut Day” twenty-one years later. For The Salvation Army’s work during WWI, President Woodrow Wilson awards Evangeline Booth, Commander of The Salvation Army in America, the Distinguished Service Medal. A new Salvation Army building complex on West 14th Street in Manhattan opens, commissioned by Salvation Army National Commander Evangeline Booth. The complex serves as site of The Army’s National Headquarters (today located in Alexandria, VA), Greater New York Division Headquarters, the Evangeline John & Mary R. Markle Memorial Residence for women, and the Centennial Memorial Temple, an expansive auditorium hosting worship services and special events. On June 14th, The Salvation Army’s Evangeline John & Mary R. Markle Memorial Residence opens its doors, providing safe, Christian, and affordable accommodations for business women and women students in New York City. The residence — the fulfillment of a dream of The Salvation Army’s U.S. National Commander Evangeline Booth — is made possible through the generous support of Pennsylvania philanthropists John Markle and his late wife, Mary, for whom the building is named. On November 11th, Evangeline Booth becomes The Salvation Army’s General (international leader). She leaves America on the highest crest of love and popularity she has ever known, and retains her American citizenship. 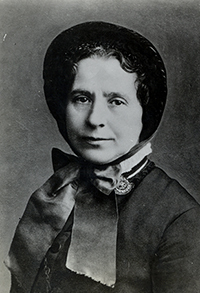 As General, she travels to such places as India, Australia, New Zealand, and Japan to promote the work of The Salvation Army. The first National Donut Day is celebrated in Chicago to help those in need during the Great Depression and to commemorate the work of The Salvation Army “Doughnut Lassies” who served soldiers on the frontlines during World War I. As World War II approaches, The Salvation Army co-founds the interfaith movement that leads to the formation of the United Service Organization, or USO. President Dwight D. Eisenhower proclaims Nov. 28th-Dec. 4th, as the first National Salvation Army Week, declaring, “Among Americans, The Salvation Army has long been a symbol of wholehearted dedication to the cause of human brotherhood.” Today, National Salvation Army Week takes place each year in May. The Salvation Army Foster Home and Adoption Unit, supervised by Salvation Army officers, is formed. The Salvation Army celebrates its worldwide centennial. The first Salvation Army-sponsored group home for adolescents in foster care opens in Lefrak City, Queens. Pioneer House opens in Queens, marking the beginning of The Salvation Army’s services to the developmentally disabled. The Salvation Army opens The United Nations Women’s Shelter, as New York City begins privatizing city-operated homeless shelters and programs. The Salvation Army begins operation of The Borden Avenue Veterans Residence in Queens, the largest veterans-only homeless shelter in the country. Salvation Army social services expand to include “preventive services,” which provides parenting and anger-management classes, and academic tutoring, to families in crisis due to drug abuse and/or child abuse or neglect. The Salvation Army’s HIV/AIDS services opens in the Belmont section of the Bronx. The Salvation Army Therapeutic Foster Boarding Home Program opens its doors to serve children who would ordinarily be placed in institutional care. To deal with the increasing epidemic of homelessness in the Greater New York area, The Salvation Army develops a Homeless Services Department. 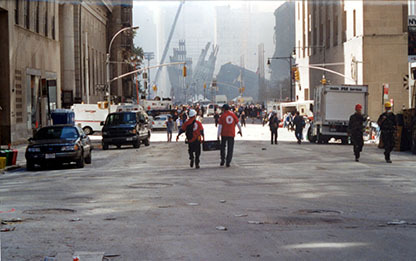 “Operation: Compassion Under Fire” — The Salvation Army’s emergency response to the World Trade Center terrorist attacks of September 11th — is unprecedented in the history of Salvation Army disaster services. From September 2001 until May 2002, when recovery operations officially conclude, The Army serves more than 3 million meals, utilizing the efforts of more than 7,000 officers and staff, and more than 32,000 volunteers, representing a total of almost 1 million volunteer hours. The Salvation Army’s Homeless Services and Social Services for Families and Adults merge to become a new version of The Salvation Army’s Social Services for Families and Adults. The Salvation Army combines its Social Services for Children with its Social Services for Families and Adults, forming The Salvation Army’s Social Services of Greater New York. 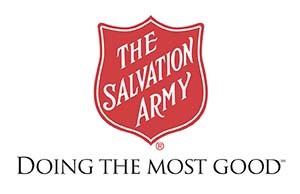 The Salvation Army introduces its “Doing the Most Good” brand promise to accompany its red shield logo. The International Social Justice Commission, brought into being by the General of The Salvation Army, opens in Manhattan, serving as The Salvation Army’s strategic voice to advocate for human dignity and social justice for the world’s poor and oppressed. The Salvation Army partners with legendary Grammy Award-winning music producer Phil Ramone in the creation of The Salvation Army Phil Ramone Orchestra for Children, an initiative providing multi-genre music-instruction and performance opportunities for children in underserved communities. The Salvation Army celebrates its 150th anniversary, or Sesquicentennial.